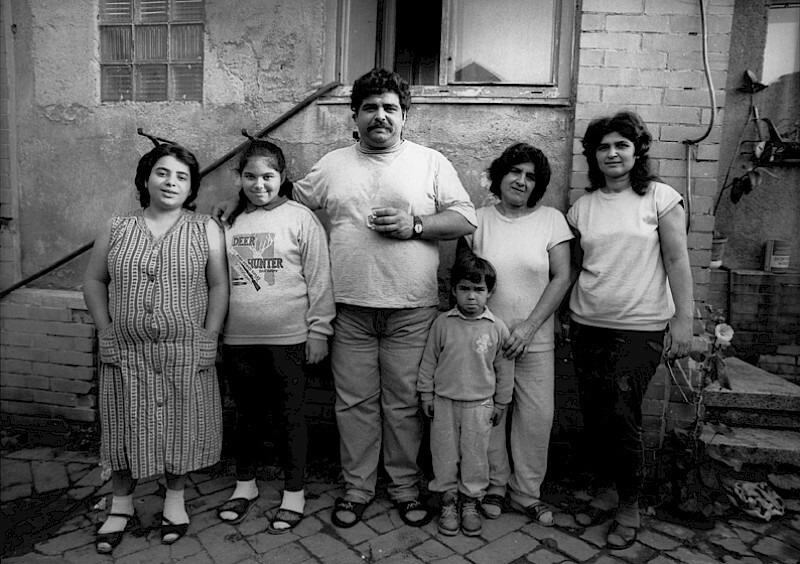 I started studying at the FAMU in Prague (1997), I visited a Roma family in Kladno. I got to know their dramatic living circumstance, the severe racism they where facing in daily life. The origin of their unfortunate situation was entirely due to their racial background and no other reasons than that. 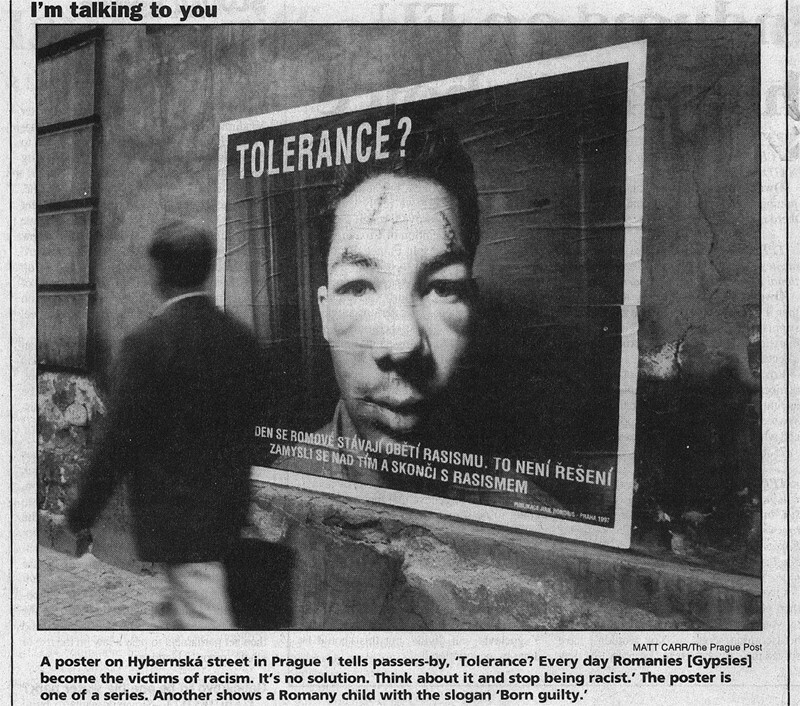 I developed The Tolerance Campaign because I believed it was the best way I could contribute to their case. Since 1989 the position of Roma got worse. Housing is in many cases still bad. 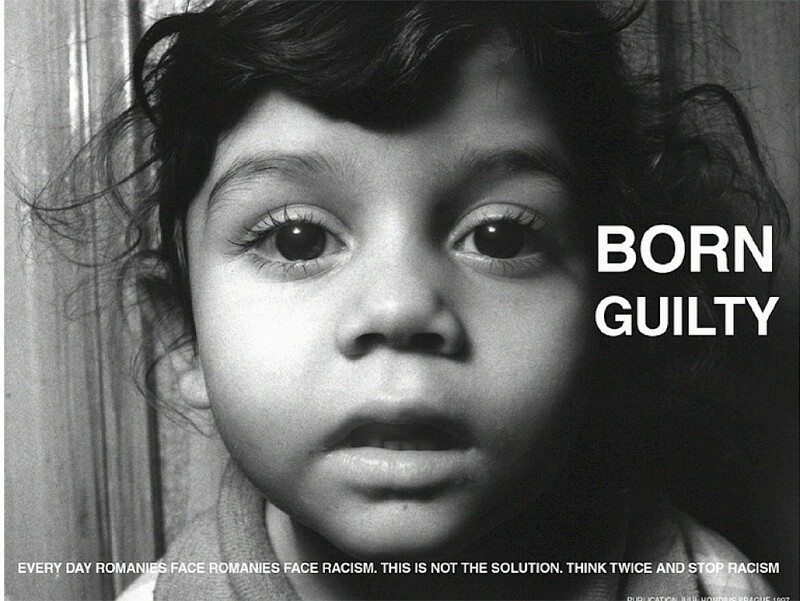 Education policy has contributed to the fact that almost no Roma kids got any further than elementary school. 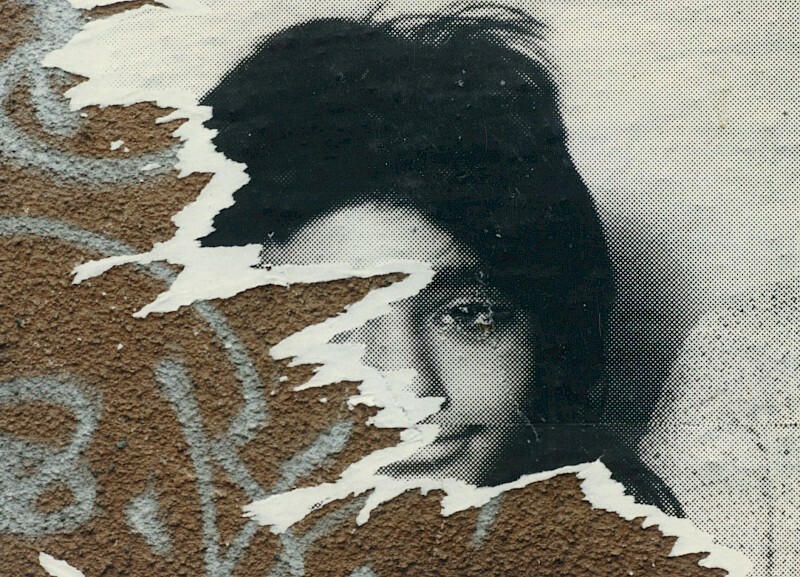 Half of orphans are Roma. 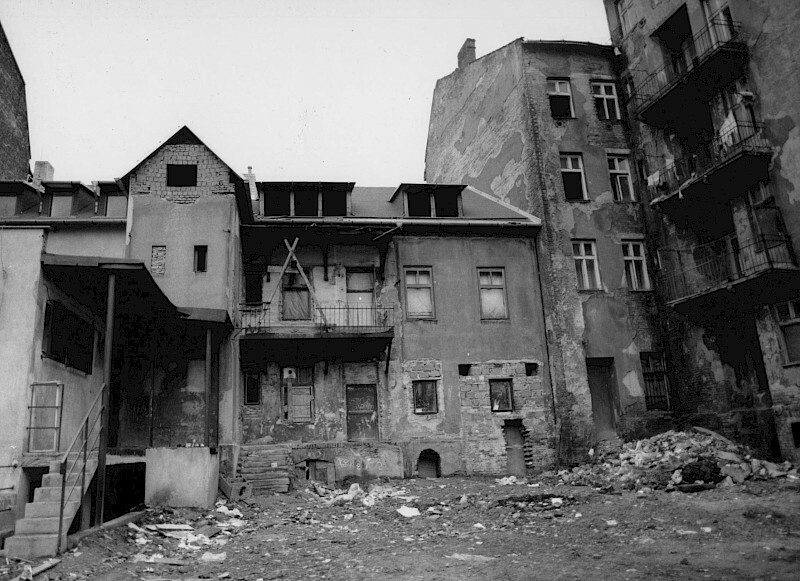 The splitting of Czechoslovakia had dramatic consequences for many Roma. 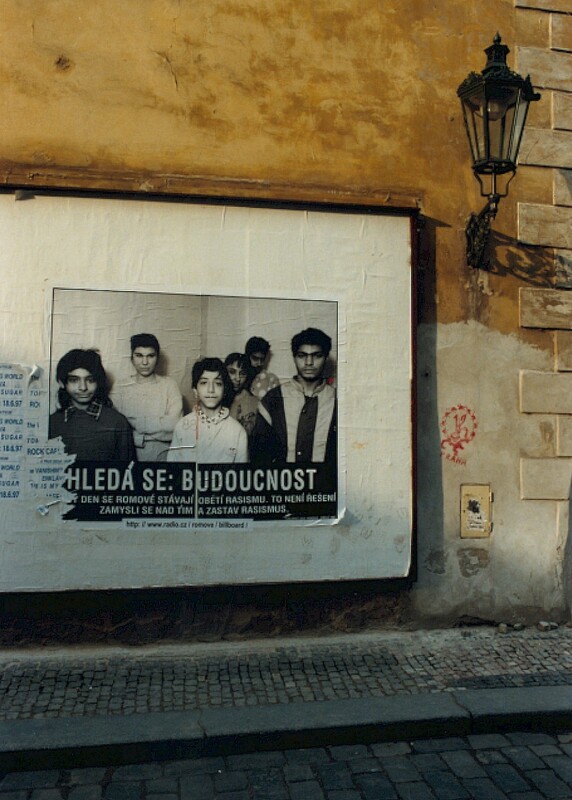 Ten-thousands of them became stateless, because government refuses to acknowledge them as Czech citizens. Non of both countries were in fact willing to accept or help them. 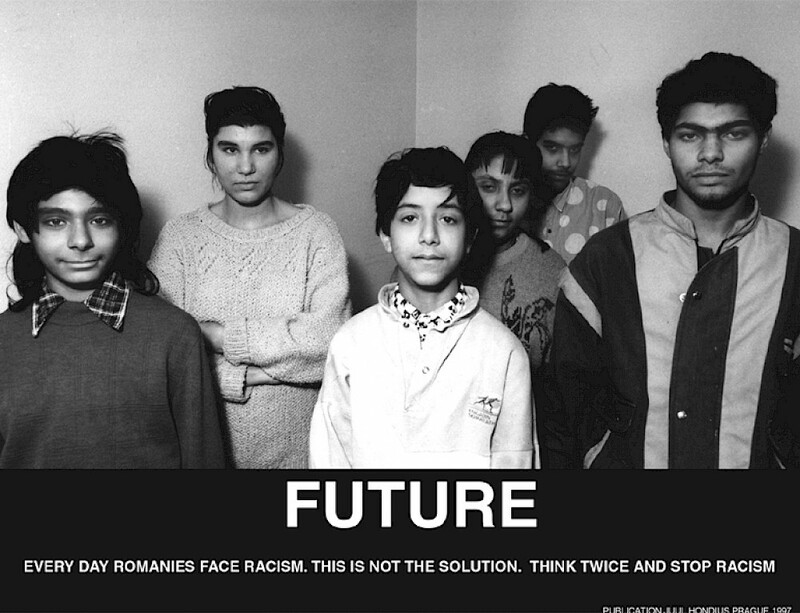 This long lasting stalemate has led to distrust, fear and apathy among Roma. 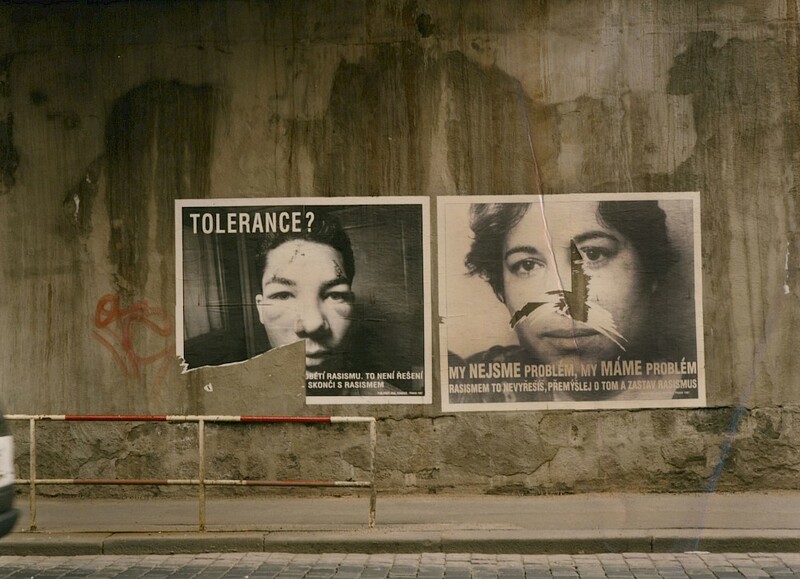 In the years before 1997 at least 25 Roma have been killed by violence based on racial motifs. 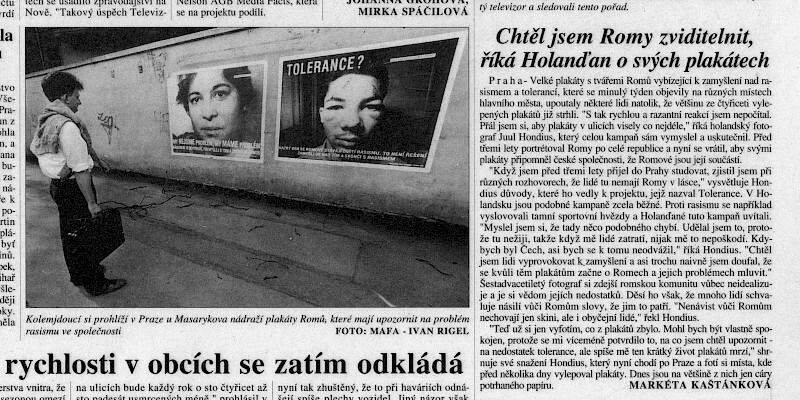 Regularly, the Czech press reports of violent attacks of youth, often skinheads. 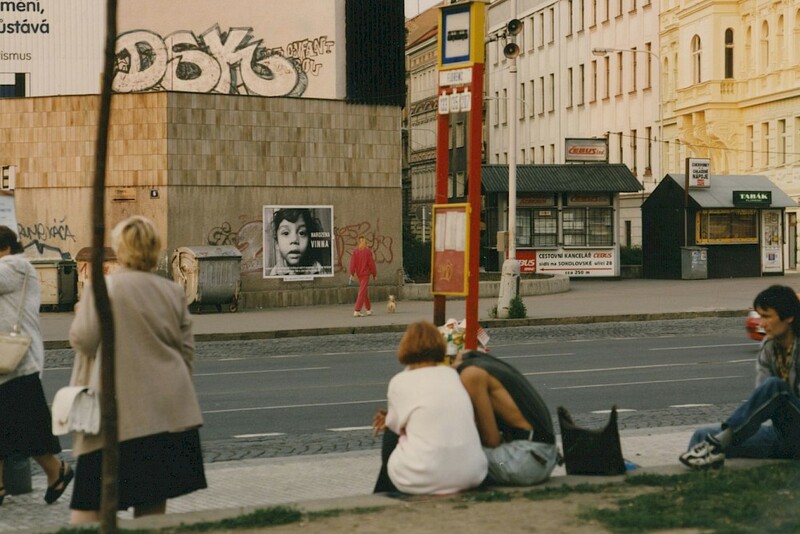 These violent attacks are not wholeheartedly condemned and even sometimes tolerated by many Czechs. 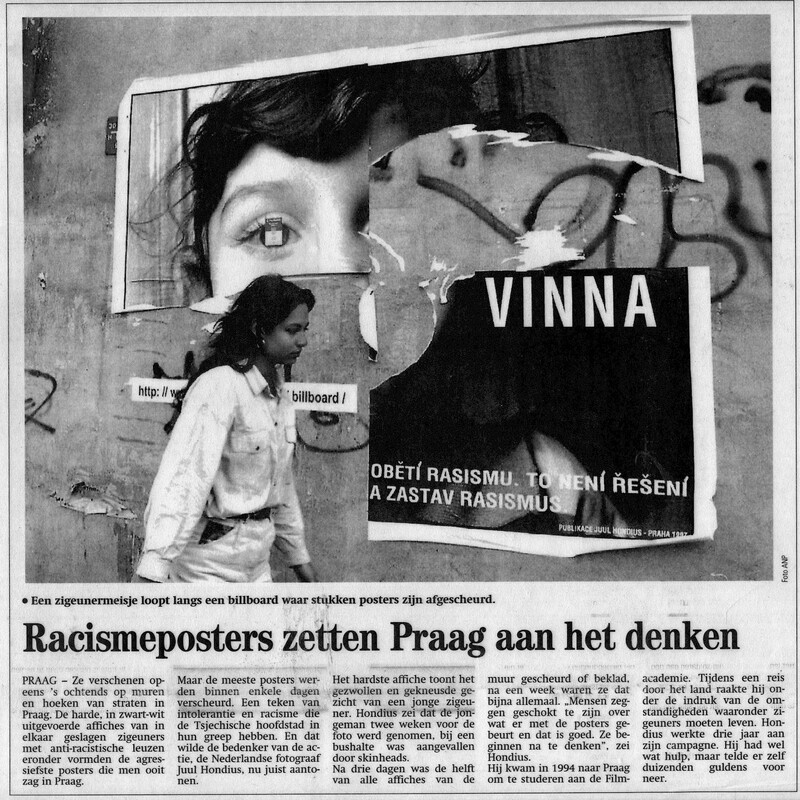 Anti-Romani prejudices are widespread and the marginal socio-economic status of many Romani only further enhances persisting cliches. I felt very involved with their destiny. How to portray an ethnic minority - and avoid the stereotypes? 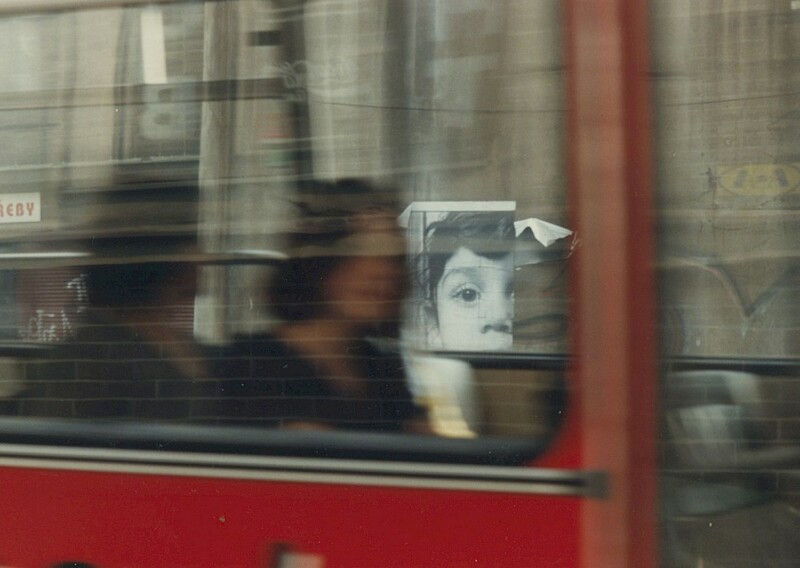 While photographing I tried to avoid to show the actual circumstances of their surrounding; the context of their reality should not be mixed up with romantic stereotypes of the wandering happy gypsy tramp in the way we see in many existing reportages. 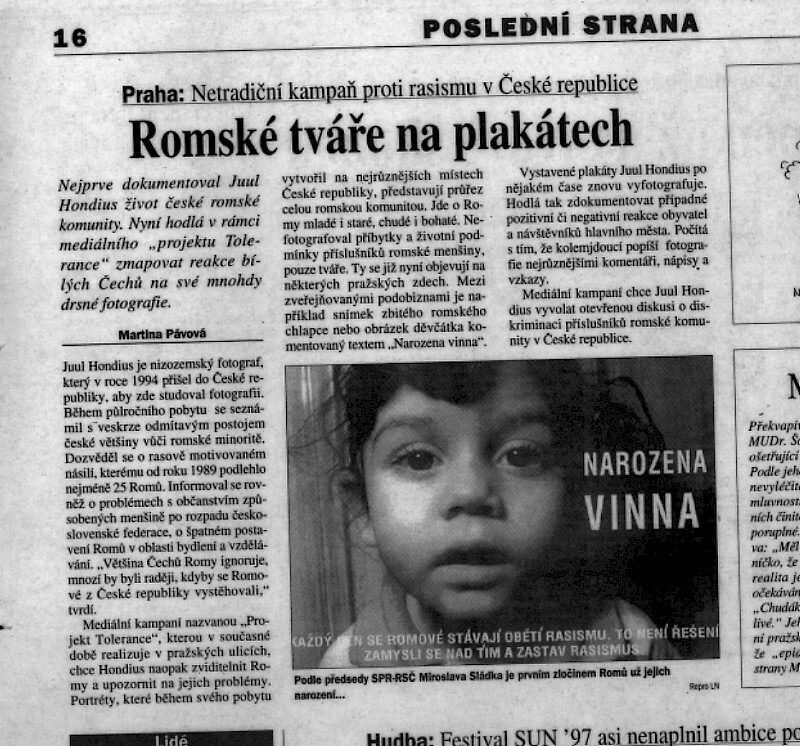 With the help of many people, interpretors & local contactpersons I travelled along many Czech cities like Most, Chomutov, Usti nad Labem, Ceske-Budejovice, Pilzen, Brno, Prerov and Ostrava to make portraits of a variety of Romani people. 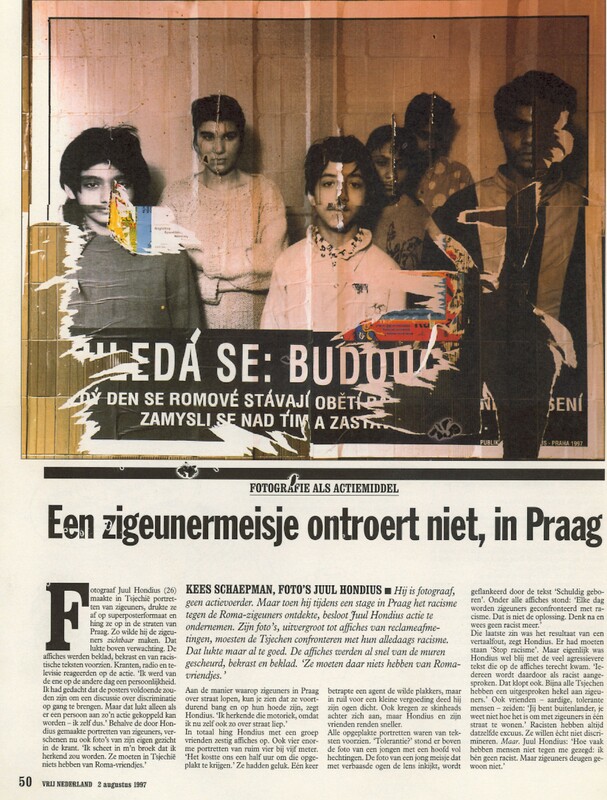 A majority of Czech citizens prefered to ignore the Roma, some would even prefer the Roma to disappear. 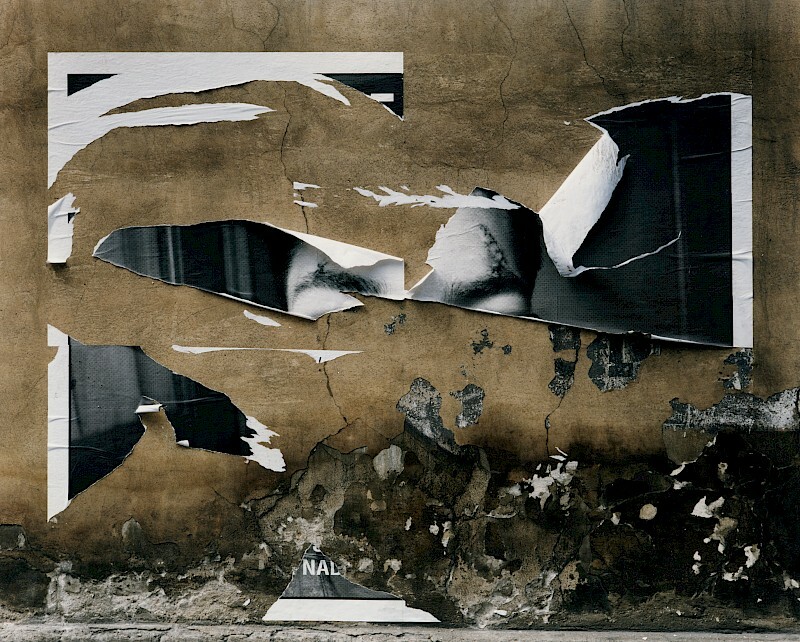 I decided to fight this ignorance by making Roma visible on the streets of Prague on large format posters with provocative texts. 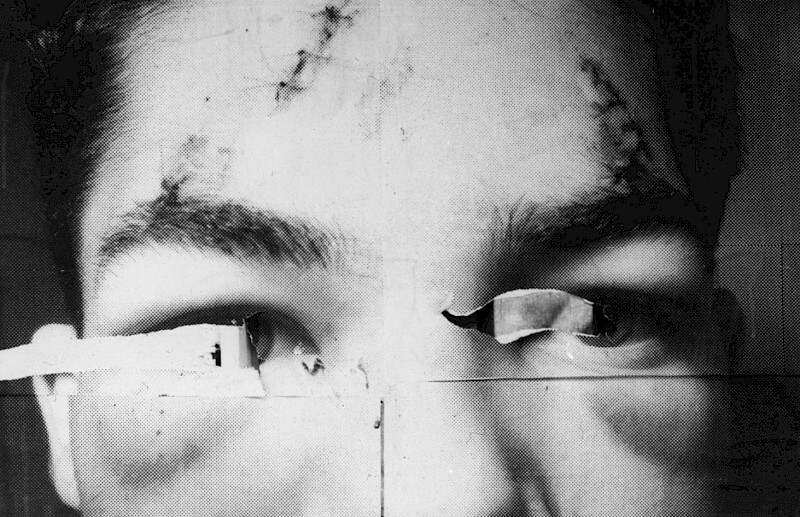 The poster designs where blown up to very large seizes; from 1.5m.x 2m. up to 4 x 5 meter. 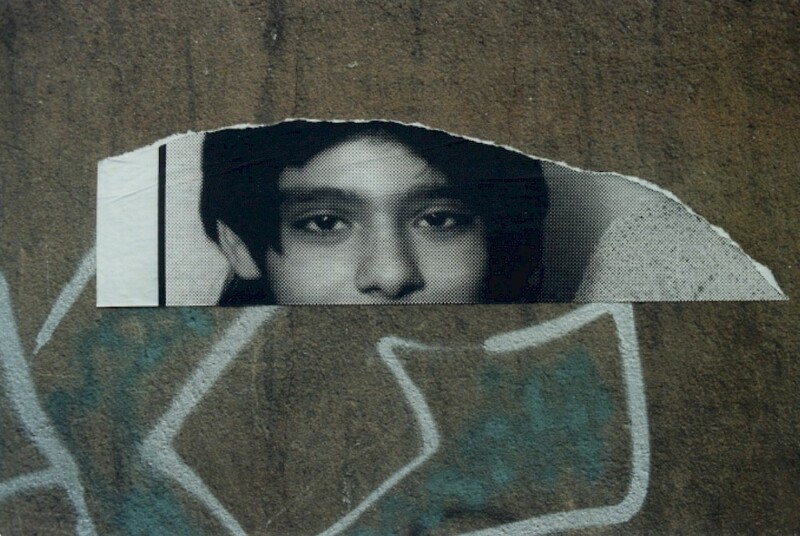 I made sure the posters where hung on walls on the streets nearby all news media agencies. 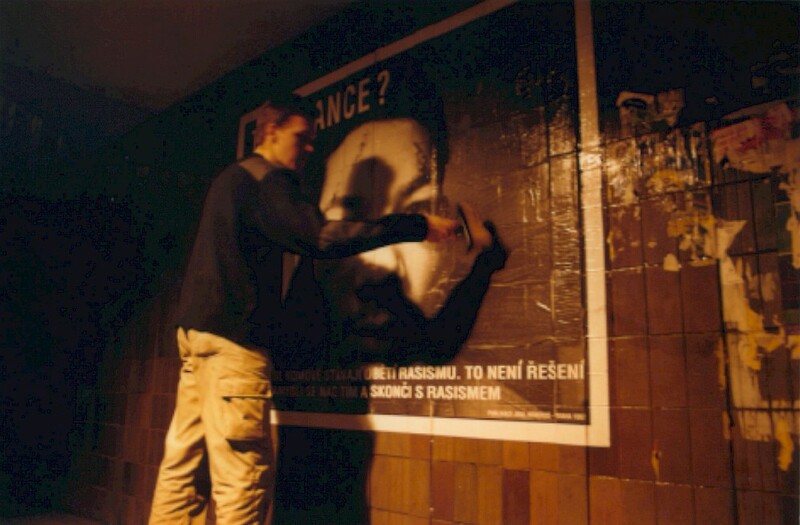 What I had expected happened: the approximately fifty posters were defaced, vandalized and smeared. 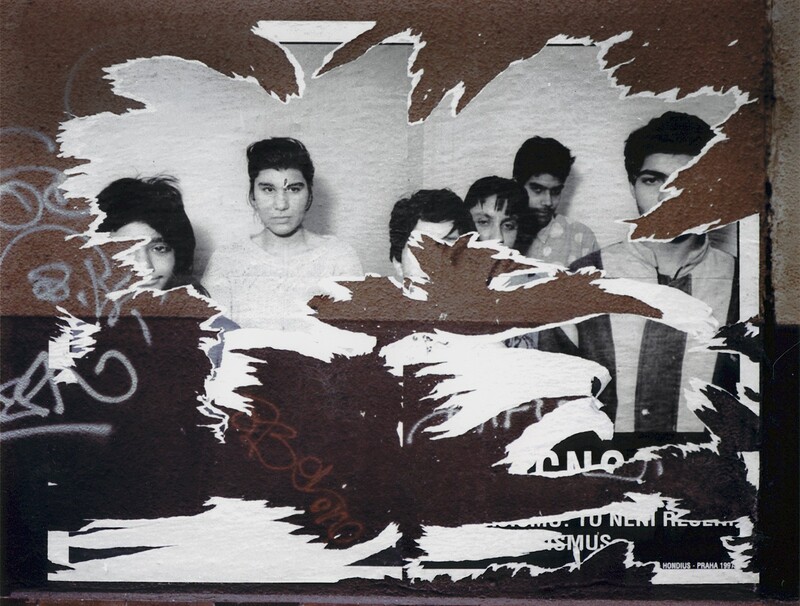 The violent images made it to the news media, as the demolitions were the visual evidence of latent racism. 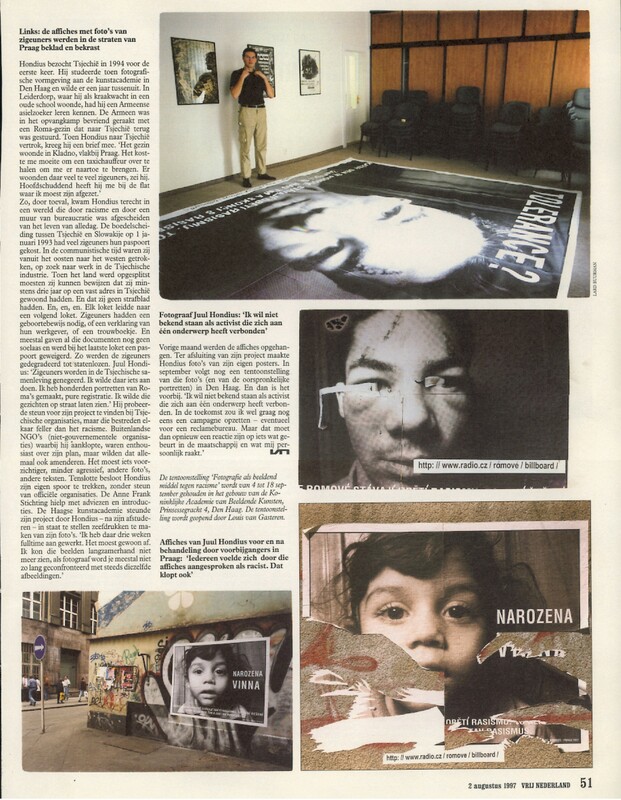 In this way, the “feed-back” of the Prague population was documented and shown by the newsmedia themselves. 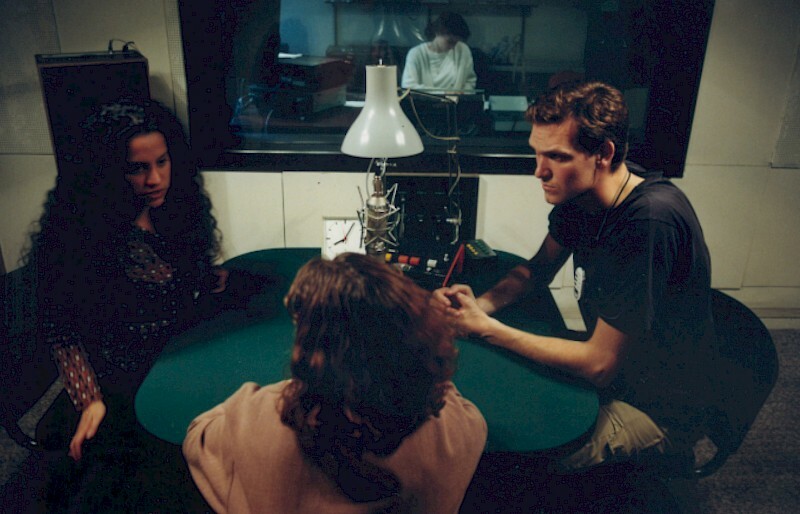 For two weeks the campaign was on shown on TV, radio and most national newspapers had shown it . People wanted to know why I, a foreigner, had created such a campaign. 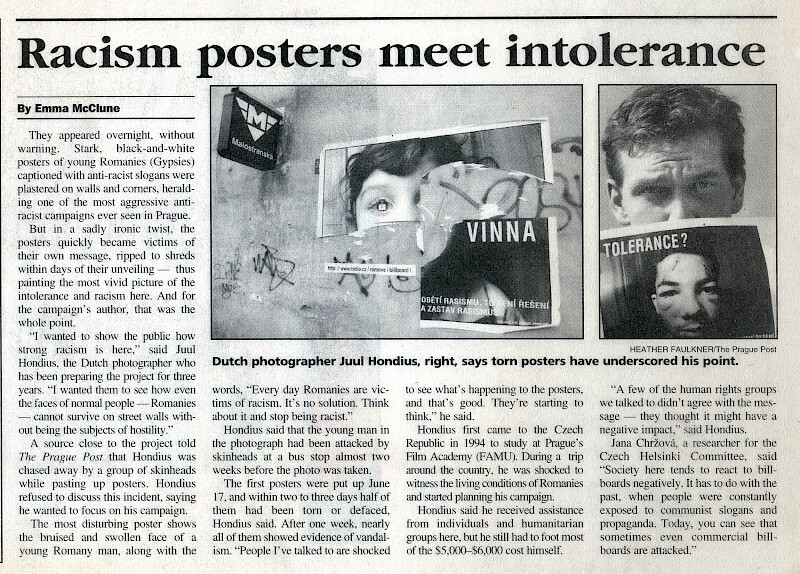 Even the more right-wing newspapers and printed out the pictures of damaged posters. 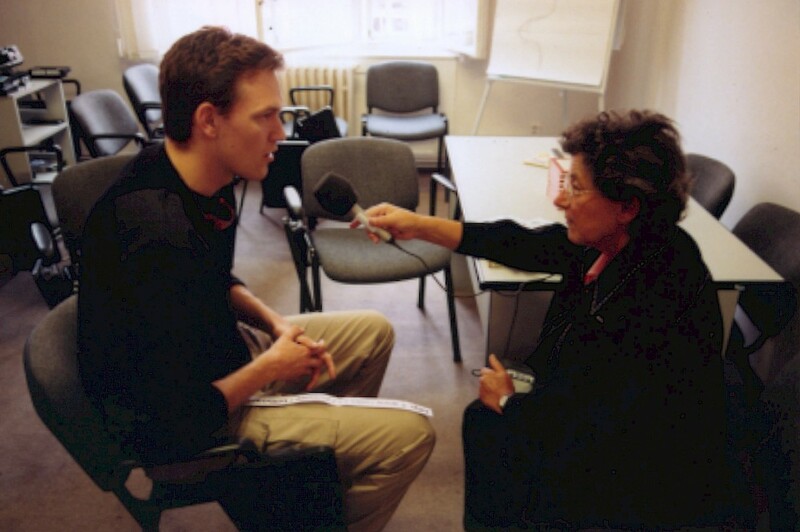 What I had produced for a mere pittance became national news and reached the international press (BBC, Reuters, ZDF, Dutch media). 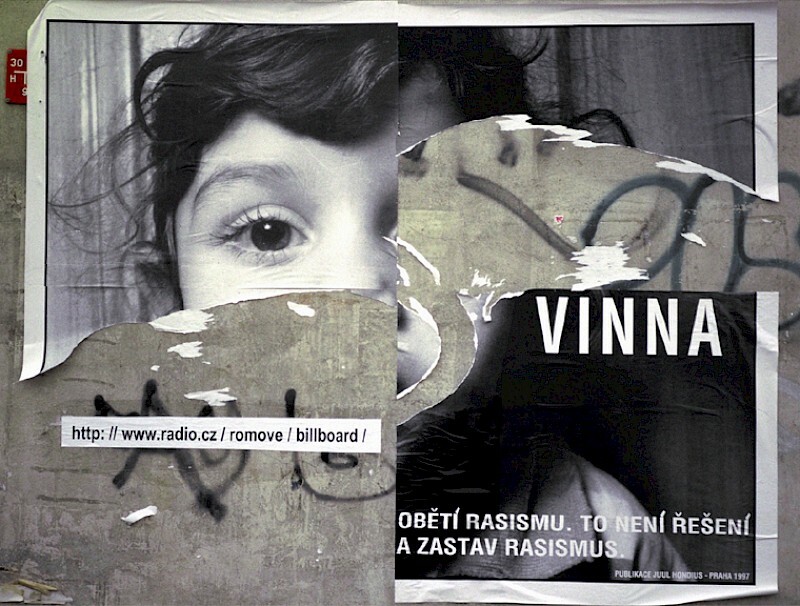 In the Czech Republic, public anti-racism campaigns were practically non-existent at the time of this campaign. 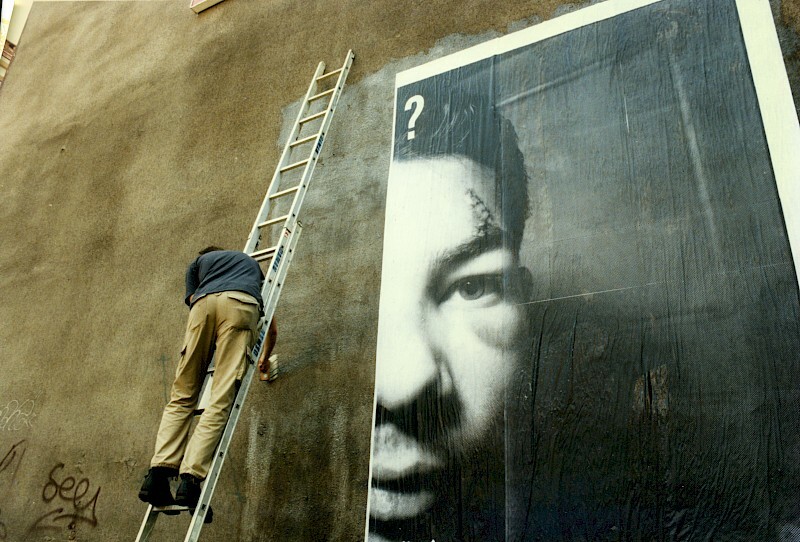 This provocative campaign tried to put the subject in the spotlight. Afterwards, other campaigns with a more positive approach have followed.